I was paging my way through Holy Women, Holy Men on a fact-checking mission when I came across the entry for December 16th. I was stunned to see that this day had been set apart to honor two architects and an artist whose work is represented here at Transfiguration: Ralph Adams Cram, designer of St. Thomas Church NYC and the nave of the Cathedral of St. John the Divine, Richard Upjohn, the designer of Trinity Church on Wall Street in lower Manhattan, and John Lafarge, painter of murals and designer of many notable stained glass windows. 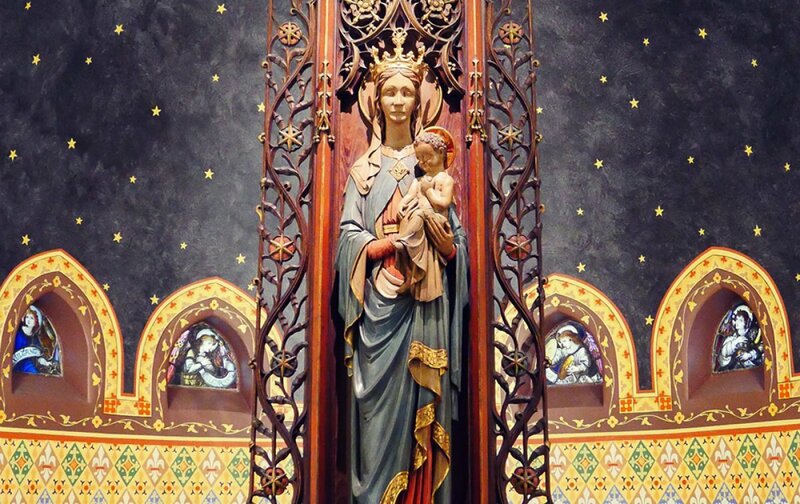 Ralph Adams Cram was the designer of our beautiful polychromed wood Madonna Shrine, located in the Transept. It was donated by Mr. F. E. Saxham Drury in memory of Elbridge T. Gerry and Mabel Gerry Drury. 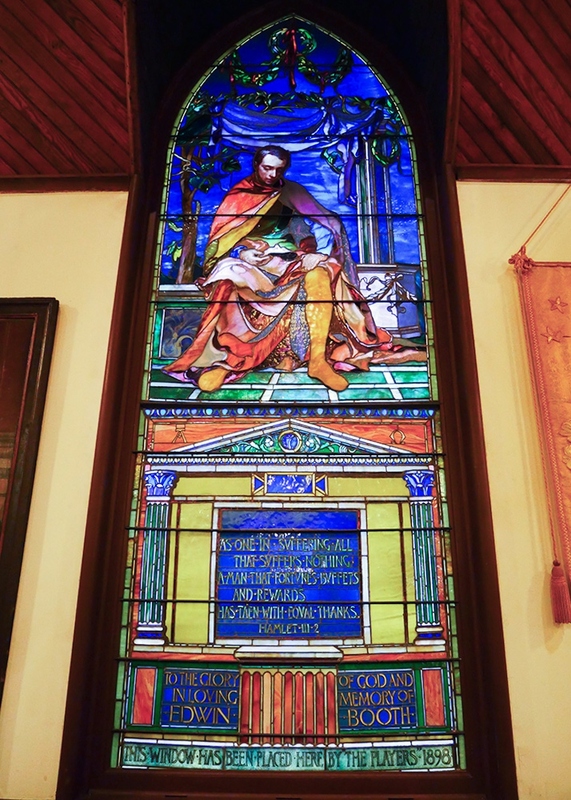 Turn to your right, and there is John LaFarge’s magnificent window depicting Edwin Booth, the leading Shakespearean actor of his time, holding a mask and dressed in Greco-Roman costume. (Edwin Booth was the brother of the notorious John Wilkes Booth, President Lincoln’s assassin.) The window was given in his memory in 1898 by members of the Players Club, which he founded. 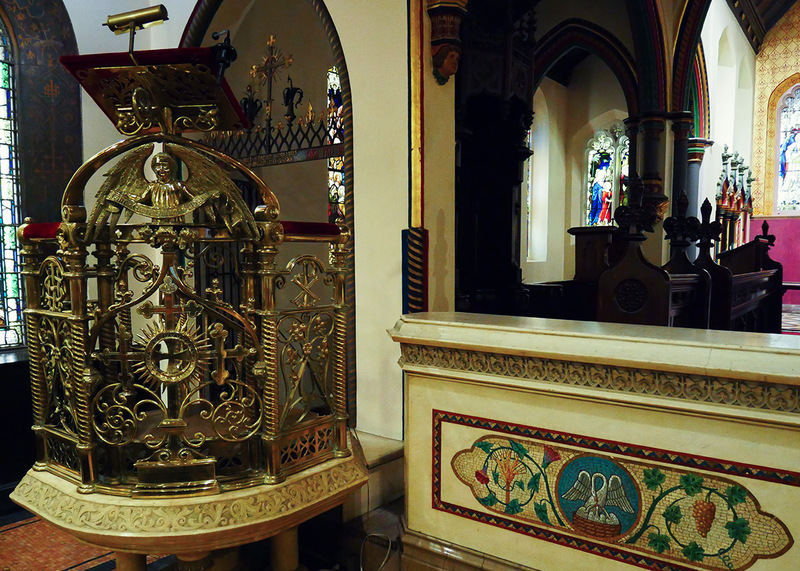 And a few steps away, near the chancel on the northeast side of the nave, stands Richard Upjohn’s beautiful and intricate brass filigree pulpit. How fortunate we are to have works by all three of these masters under the roof of the “Little Church”. I will give thanks when December 16th rolls around.